Calendars, Kanban, and Kids – Can I Run My Family Like a Project Team? Around Christmas, I had a realization: my family is not very different from a large company. The leadership team generally aligns on strategic priorities, but differs on how best to meet them. There is a significant number of high priority projects that need to be accomplished within a set time and under (what appears to be) an ever-shrinking budget. And, at any given time, there is at least one member of the staff who is in tears because another staff member took their Pokémon cards. Having had this realization, I asked myself whether any of the successful recommendations I had made at any number of my clients would be worth implementing at my own little “company.” So, with New Year’s resolutions on the horizon, I went to work identifying what specific and actionable recommendations I could make to increase efficiency and improve productivity throughout my own organization. Of course, before I could make any recommendations, I needed to identify the “areas of opportunity” I wanted to address. With me traveling for work a large portion of each week and my wife homeschooling 5 kids between the ages of 12 and 2, our goal has always been to increase our efficiency and do what we can to make me more “present,” even though I may not physically be there. Remote workforce and organizational efficiency? I think I may have seen this movie somewhere — we needed to ditch the paper and move to the cloud! First and foremost, we needed to get rid of the monstrosity that was our family calendar. Great in theory and horrible in practice, a paper calendar reflecting the comings and goings of 7 people begins to look like modern art after just a couple of rescheduled events. The solution here was easy enough. Since we already had a family email address, we just put all of our family’s events on that account’s calendar and displayed the calendar on our TV as our default input. Now, everyone can see what’s coming up whenever they turn on the TV and when we all get together to discuss the week or month ahead, the text is clear, scribble-free, and a rescheduled appointment is only a drag and drop away. Problem solved! The email account’s calendar has the added benefit of being able to sync to our phones, so no more manual rescheduling of our personal calendars to match a paper change in the kitchen! 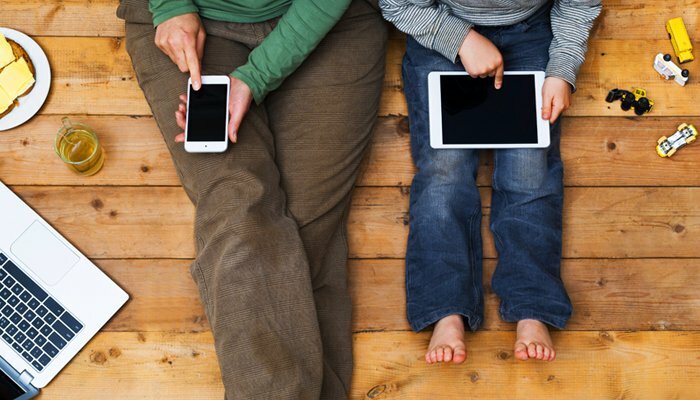 Each of our kids has his or her own iPad, but there wasn’t any standardization about what apps were on the iPads, what passwords were being used, or much else. Also, the iPads weren’t specifically assigned to any one person, so there was always fighting over resources. Clearly, the hardware asset management needed to be completely overhauled. The only question was approach; do we go for BYOD or enterprise issued? In other words, how much control did we want to let the kids have? Given that the kids had just received an Xbox for Christmas and that my wife and I both hate the idea of the kids isolating themselves in a corner and vegging out to YouTube or Netflix, we decided that the iPads would be for work only. We wiped the iPads, synced them all with a single Apple ID, installed the suite of educational apps we wanted them to use, and that was that. Now they can all see the family calendar, they are distraction free when doing their school work, and the fighting for resources is gone. Plus, the cries for “media time” have already diminished significantly since they are now forced to watch shows and play games together — oh, the horror! Trello – Kids Love Kanban! Now that we’ve got our enterprise environment locked down and we’re able to easily track everyone’s schedule, we wanted to tackle the issue of task assignment. Up to this point, each of them had a notebook and we (read: my wife) would write down their tasks for the day, such as schoolwork and any chores outside of their normal “feed the cat and dog” type stuff. Like the calendar though, this became complicated rather quickly. What if you have changes or questions? How do you check on progress without bothering the person doing the work? How could my wife avoid being drowned by a ton of people standing at her desk? How can I be involved when I’m 1,000 miles away? Again, a workplace solution found a place in our home, and since then I’ve found that the kids love Kanban. They really do. They love dragging and dropping tiles. They love using comments to ask questions. They love the fact that everyone can see they’re ahead in their tasks (unless they aren’t ahead…then they don’t like it nearly as much). They love changing their profile picture every 15 minutes (maybe not a benefit but it does keep them engaged — so much for getting rid of distractions). From our side, we love that we don’t have to constantly ask about their progress and I can be involved in daily tasks when I’m on the road. Slack – Because Why Not? To be honest, this was more of a carrot for them. They all love texting people, but we really hate that that there isn’t a great way to track who or what they are texting in iMessage and with a soon to be 13-year-old, that can be a bit scary. So again, the solution was to leverage a tool from the workplace to add some communication capabilities to the family. Once we set the expectation that the poo emoji is rarely acceptable and created #chores and #schoolwork channels, it has become a useful tool for them to collaborate with one another. Plus, it has the added benefit of allowing the kids to keep in touch with us when we’re out (note: not always a good thing — like on date night). The experiment is still in its early stages, but so far it is running well. I’ll be sure to keep everyone posted on how things are going as we progress. In the meantime, I’d love to hear any feedback or questions you may have in the comments below. One final thing, though: I’ve noticed that Trello keeps creating this “HoneyDo” board with all these tasks assigned to me like “Replace the toilet” and “Paint the bedroom.” If anyone can tell me how to keep that board from showing up, I’d greatly appreciate it.